What is the Western Channel Observatory? The Western Channel Observatory (WCO) is an oceanographic time-series and marine biodiversity reference site in the Western English Channel. 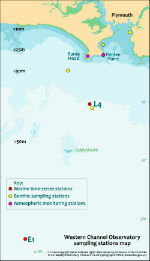 In situ measurements are undertaken weekly at coastal station L4 and fortnightly at open shelf station E1 using the research vessels of the Plymouth Marine Laboratory and the Marine Biological Association. These measurements are complemented by PML's recognised excellence in ecosystem modelling and satellite remote sensing science. By integrating these different observational disciplines we can begin to disentangle the complexity of the marine ecosystem. The WCO measures several key parameters important to the functioning of the marine ecosystem such as light, temperature, salinity and nutrients. Station L4 has some of the longest time-series in the world for zooplankton and phytoplankton, and fish trawls have been made by the MBA for a century. Station E1 has a hydrographic series dating from 1903. These long series are complemented by hourly measurements made at our moorings situated at both stations. These can elucidate changes not captured by the routine weekly sampling. PML operates and develops two scientific buoys at L4 and E1. These produce data every hour allowing short duration events, such as inputs from the Tamar estuary to be captured. The data are also used by the UK Met Office for operational oceanography applications. PML operationally processes satellite derived fields of sea-surface temperature and ocean colour, which can be used to derive chlorophyll. These data allow the point measurements at L4 and E1 to be set in a wider context. The western English Channel is a useful test area for developing ecosystem models. Data from the WCO are used to develop, parameterise and validate models and ideas. The unique and comprehensive Benthic survey of Plymouth Sound and the environs of L4 and Rame Head, started under Oceans 2025, is continuing as part of the WCO. VALMER is a European-funded project which is investigating how providing monetary values for marine ecosystem services can support effective marine planning and management. PML has recently setup an Atmospheric Observatory at the mouth of Plymouth Sound: an ideal position for monitoring the impact of anthropogenic and natural sources of trace gases and their fluxes.